"We are not dictators or authoritarians. We do not have a track record of human rights violations, violence or corruption. We will put all that we have on the line to improve this nation," the incumbent said. Legal certainty was the first question that came up in the debate, with moderator Ira Koesno asking the candidate pairs about their strategy to fix contravening regulations at the national and regional levels. Prabowo said he would empower the national law agencies by involving legal experts to help synchronize national law and local ordinances. Jokowi, meanwhile, suggested that he would place all legislative functions of ministries under the National Legislation Center, directly under the President, to address the issue. 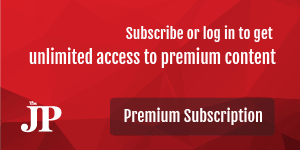 “But in reality, there are still contravening regulations, so we need the help of experts to speed up efforts in addressing the issue; there must be a breakthrough," Prabowo said. The former military general used the term again when answering a question related to what he would do to stop faith-based persecution and discrimination in the country. “As the chief law enforcement officer, meaning the highest law enforcement official, I [if elected] will instruct all law enforcers to not discriminate against anyone based on religion, ethnicity or race,” Prabowo said. Jokowi and Ma’ruf did not question what Prabowo meant with the term, but the incumbent’s campaign team was quickly to criticize it. “[The term] mirrors [Prabowo’s] subconscious thoughts of using a president’s position as a tool to intervene with the law,” Indonesian Democratic Party of Struggle (PDI-P) secretary-general Hasto Kristiyanto said. Sudirman Said, a member of the Prabowo-Sandiaga campaign team, later explained that what Prabowo meant was that a president played a key role in urging law enforcement officials to truly serve the people. When the question regarding strategy to end corrupt practices within the country’s bureaucracy came up, the incumbent appeared to give a safe answer, saying that strengthening supervision and transparency in the recruitment process were among key ways to address the problem. 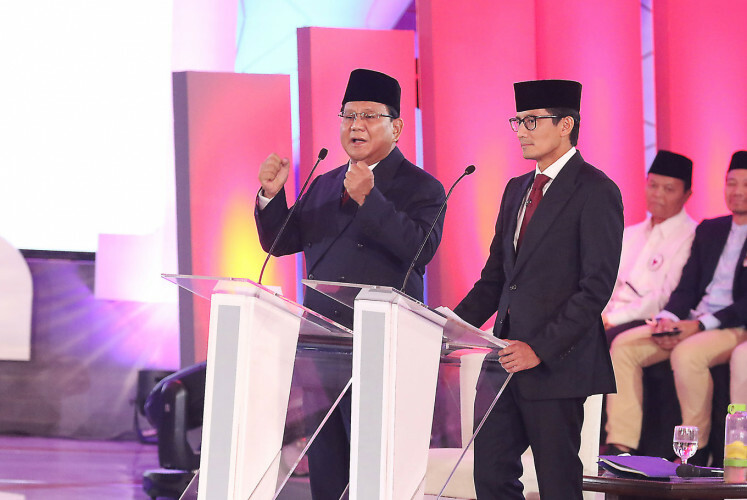 Prabowo, however, asserted that he and Sandiaga would resolve the root causes of corruption by increasing the salaries of civil servants and law enforcers as he believed that improving their welfare would prevent corruption. “The root of the problem is that civil servants are paid very little. If I am president, I will improve the lives of civil servants. How will I do that? I will raise taxes,” Prabowo said. Calling state officials’ salary “unrealistic”, he cited a governor’s salary base, which was "only" Rp 8 million (US$562.9). Prabowo, however, did not elaborate on additional details, such as allowances, for elected officials. If the officials still committed corruption after earning a higher salary, might as well give them drastic punishments, such as “sending them to a gulag and let them mine sand,” he added. The incumbent asserted that better supervision, including by the media and the State Civilian Bureaucracy Commission (KASN), was important to have a corruption-free bureaucracy. Jokowi considered legal reform, firm law enforcement and strengthening the Corruption Eradication Commission (KPK) as keys to combating corruption, while Prabowo wanted to increase the income of court justices, prosecutors and officers to do so. The first presidential debated marked the debut appearance of Ma’ruf, who participated in an election debate for the first time, after weeks of receiving training from the campaign team to sharpen his political communication. However, many said the cleric delivered a rather underwhelming performance, especially when being compared to Sandiaga, who has experience in such debates and was somewhat active in backing up Prabowo’s statements. Perhaps one of the most memorable moments from the debate was when the cleric ran the clock after Jokowi finished answering a question from panelists about conflict between law enforcement and human rights. Seconds still remained for Jokowi and Ma’ruf to explain more about the camp’s view on the issue, so Ira asked whether the vice presidential candidate wanted to add something to their statement. Jokowi took a direct jab at Prabowo’s anticorruption commitment while questioning the fact that the Gerindra Party had nominated at least six former graft convicts as candidates in the legislative election, citing Indonesia Corruption Watch (ICW) data. Prabowo defended himself and his party, calling the ICW report “very subjective” and saying that the party was free from corrupt practices. He added that he would send party members who committed corruption to jail. “May I reply to this?” Prabowo abruptly cut off Jokowi’s question, but Ira told Jokowi to go on with his question. 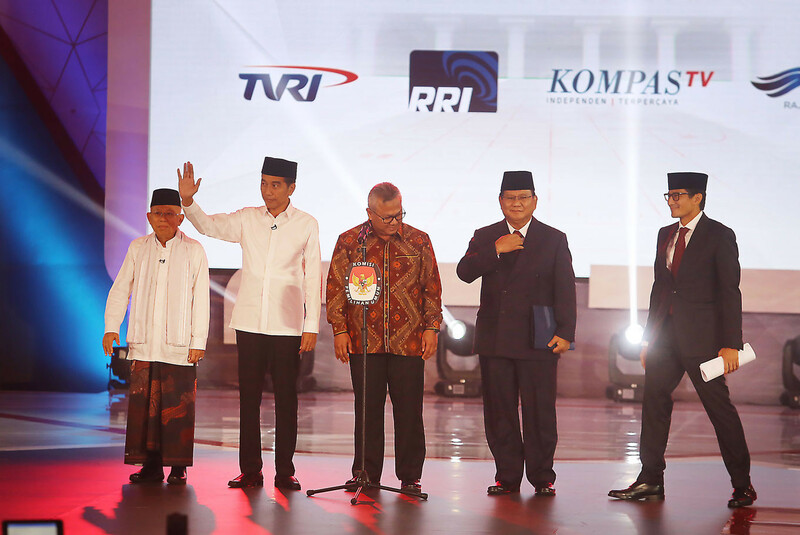 The interruption triggered tension on Prabowo’s side. 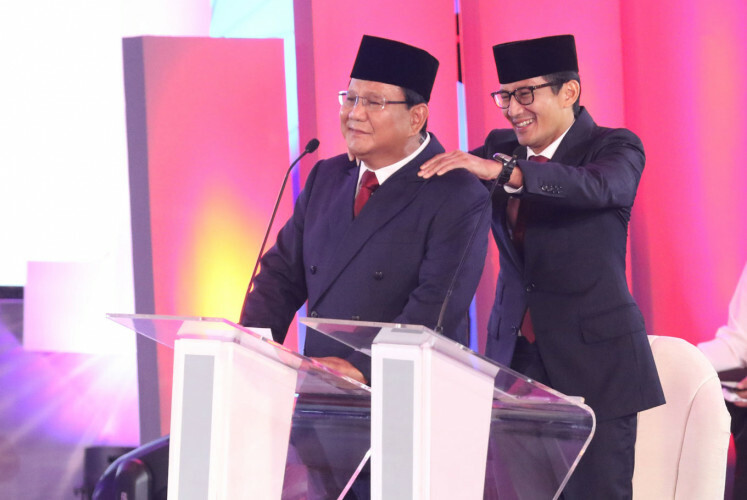 Sandiaga went on to massage the former general’s shoulders in an apparent move to calm him, rather jokingly. Prabowo went on to say that Indonesia was a democracy and that the former convicts had gone through the legal process so they could participate in the election. He said it was up to the people to decide whether they would vote for them. Jokowi questioned Prabowo-Sandiaga on the pair’s consistency in promoting gender equality through policies as promised in their campaign vision, with the incumbent saying that the executive board of Gerindra was dominated by males. The incumbent went on to compare Prabowo’s team to his own Cabinet, which comprises nine women serving as his aides in ministerial seats. In response, Prabowo argued that the female ministers had issued policies that had done more harm than good, adding that Jokowi should not be proud of appointing women if the programs had not benefitted the people. Prabowo, for instance, called law enforcers politically bias because a number of regional leaders who had openly thrown support behind Jokowi-Ma’ruf were free from scrutiny, but a village head in Mojokerto, East Java, was sent to jail after he had declared support for him. The case, Prabowo said, had “violated human rights”, particularly freedom of expression. The incumbent went on to cite the case of Ratna Sarumpaet, one of Prabowo’s supporters whose bruised face initially triggered a political brouhaha, in what appeared to be an attack on Prabowo’s camp. “There was a joint press conference, but it turns out it was just [a result of] plastic surgery. There’s no need for comedy,” he said. A similar statement was made by the incumbent when Prabowo lashed out at Jokowi’s economic policies, particularly the import of rice and sugar, which the rival camp claimed had harmed local farmers. Prabowo asked Jokowi whether the latter could ensure that his ministers, some of whom were businesspeople, did not have conflicts of interest when deciding to implement import policies. 7. Settlement of past atrocities: Jokowi takes the issue against Prabowo? 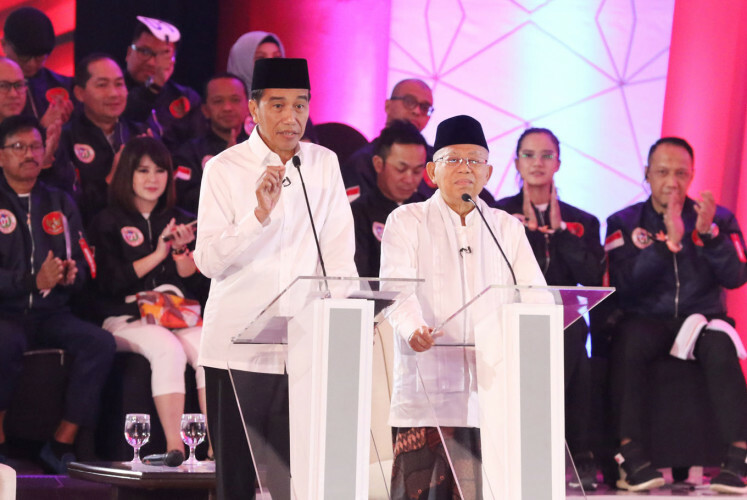 During opening statements, which was the first segment of the debate before it officially started, Jokowi and Prabowo took turns to present their own camp’s visions related to the topics of the debate. In his speech, Jokowi mentioned his administration’s efforts to solve human rights abuse cases and acknowledged challenges that had hampered the process. “However, we are still committed to resolving [the cases],” he said. There was no such thing mentioned in Prabowo’s own visions delivered on Thursday. The former general was implicated in the kidnapping of pro-democracy activists between 1997 and 1998. Military documents leaked in 2014 showed that the Indonesian Military’s (TNI) officers ethics council had discharged Prabowo for his involvement in the forced disappearances, among cases that Jokowi’s administration had promised to address. The topic of breakthroughs to solve the cases did not come up during the debate—whether in the panelists-made questions that were picked randomly by the candidates or during the open debate between the rival camps. In his closing statement, however, Jokowi appeared to take a jab at Prabowo in regard to the latter’s tainted human rights track record.